Wilfully Obscure: Splitting the Difference # 24 - Pitchblende/Swirlies - Working Holidays (November) (1993, Simple Machines) + bonus! 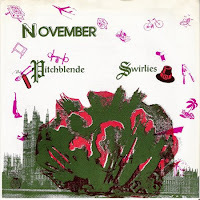 Splitting the Difference # 24 - Pitchblende/Swirlies - Working Holidays (November) (1993, Simple Machines) + bonus! Once upon a time, say 1993, a good-hearted indie label based in Arlington,Virginia had a brash and innovative idea - release a series of split 7" singles every month for a full calendar year, featuring the creme de la creme of the indie pop underground. And so it came to pass, from January to December of 1993, Simple Machines Records followed the clever blueprint outlined above, pumping out twelve split 45's, graced by such period luminaries as Small Factory, Versus, Nothing Painted Blue, Superchunk, and the Swirlies. A funny thing happened when Simple Machines decided to compile all the tracks onto one CD however wasn't enough room for all 24 songs. By sheer coincidence, two of the participants, Bratmobile and the Swirlies opted out of the digital migration. As luck would have it though, I bought the November installment which included the Swirlies, who we've featured here before. It's a damn good thing too because these fractured, heavily-flanged dream-popsters delivered a keeper, "Trudy," that you could only get here. In fact, this minute and forty-nine seconds of whammy bar wonderment would have fit like a glove on one of their early Taang! Records singles, or equally so their Blonder Tongue Audio Baton album. As for the band on the opposite side of the record, Pitchblende, their selection "A Penny For the Guy" did make the CD cut. I was never an aficionado for their dynamic brand of noisenik rawk, but that's just me. As a bonus for you Swirlies fans, I'm also sharing a downright lo-fi four-song demo they cut in 1991, which features an early incarnation of "Trudy," as well as "Chris R," which would become a relatively popular single side. nice, man. That was the only Working Holiday 7" I ended up getting, too much money from now tiny wallet back then to subscribe to the whole series. This was the best of them all. where'd you get that demo? I got the demo from someone on Soulseek (file sharing platform). This recording does not exist! 2) That much more attention must be devoted to 4-track recording skills to generate something listenable. In fact, the fact that I evidently never learned either of these two things (see free downloads at Swirlies website) can be taken as flimsy support of the tapes non-existence.... (yeah, this is bad science... so what). is it possible for you to reupload this? thanks so much! Just updated the links to both. Thanks for alerting us. The links have been updated. Thank you Thank you Thank you! "Trudy" popped into my head a few weeks ago. I couldn't figure out what it was on: not the Swirlies CDs I had, not my Working Holiday comp. I was in college when it came out, so must have played it on my radio show. Now, years later and working at a community radio station, I wanted to play it for people again. THANK YOU for making that possible! Hey Spavid, i would be super-grateful as ever for a re-up of this at some point. I lost the files. Will have to re-rip the record again. Look for it in the next batch of re-ups (hopefully).